To all the sweet-tooth bakers out there – brace yourselves! We are excited to share a mouth-watering recipe from one of our creative customers. 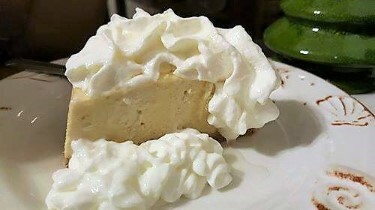 Kathleen Bowen Simons shared with us her New York Cheesecake recipe that is low-carb and we are thrilled to feature it! Makes at least 8 and up to 12 servings, depending on desired size. Prepare springform pan by cutting parchment in circle to fit bottom; then apply nonstick cooking spray evenly over bottom and inside wall of pan. Mix all crust ingredients together well in a small bowl. Press the crust mixture as evenly as possible to cover bottom of pan. Place the crust-lined pan in freezer while completing the filling. Mix the first three (dry) ingredients together well in a small bowl and set aside. Place the cream cheese, sour cream, and extract in a larger mixing bowl and blend (using a hand mixer or stand mixer) on low to just mix. Add each egg one at a time, just mixing it into the batter. Scrape sides and make sure all is mixed in. Remove the crust-filled pan from the freezer. Take piece of aluminum foil and place pan on top of it. Bring the foil up over the bottom of the pan and press so it encases bottom. Place 1 cup of water in bottom of electric pressure cooking. Place trivet (the one that came with the appliance or a similar one to fit – that is not solid. If desired, place a square of foil over top of the filled pan and lightly bend it to keep loosely atop pan while cooking (I do not add this and any moisture or little divots on top are easily blotted with a paper towel after cooking. Close electric pressure cooker and cook at High Pressure for 25 minutes. Once active cook time is done, allow to sit in Natural Pressure Release mode (on IP, warm light will be on) for 10 minutes. Then, if normal release is not permitted by appliance, Quickly Release any remaining pressure. Remove the cheesecake form the appliance, gently blot any water/moisture drops atop cake and allow it to cool on counter for 30-60 minutes. Ne aware some of the butter in the crust has probably escaped into the bottom foil cover, so I suggest placing hot cheesecake onto paper toweling to capture it. Once cooled down, refrigerate at least 4-6 hours prior to serving. The outer ring of the springform pan can be gently removed once counter-cooled or may be left on. In any case, prior to opening spring on ring, run a thin knife carefully between cheesecake and outer wall if the cake has not receded a bit form the wall (it usually does noticeably recede upon completion of counter cooling). ¾ cup sour cream, 2-3 TBSP Sukrin Gold, ½ TSP vanilla – mix well and spread evenly over top of cheesecake once it has cooled completely in refrigerator. Very nice with some fresh berries on top. At time of serving, a flavored drizzle topping may be quickly made with Sukrin Gold or Sukrin Fiber Syrup Clear. To 1 TBSP of the Fiber Syrup, add ¼ TSP of desired flavoring extract (I have used maple flavoring in the Gold Syrup) or 1 TSP of fresh citrus juice (Meyer lemon is excellent). I top with a little fresh cream and then spoon the drizzle over the servings. Thanks so much for sharing, Kathleen!